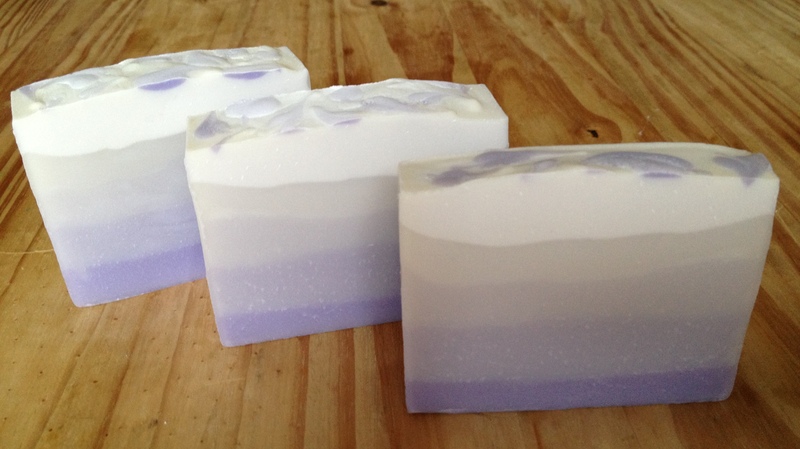 Named after the fragrance that gives it its fresh, juicy scent, Wild Berries is a straightforward five layer gradient soap coloured with ultramarine violet. Will be fully cured and ready for sale on the 29th August. 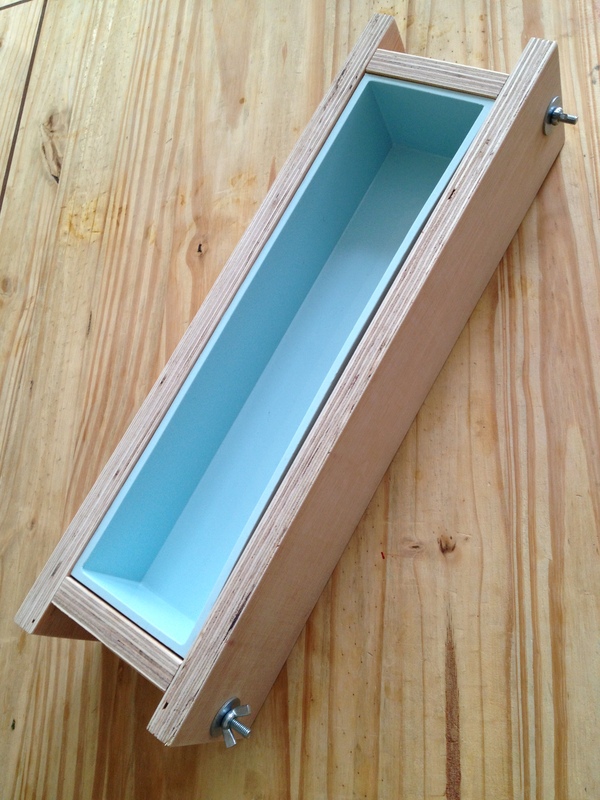 So what luxury to have a mould already furnished with a silicone liner! 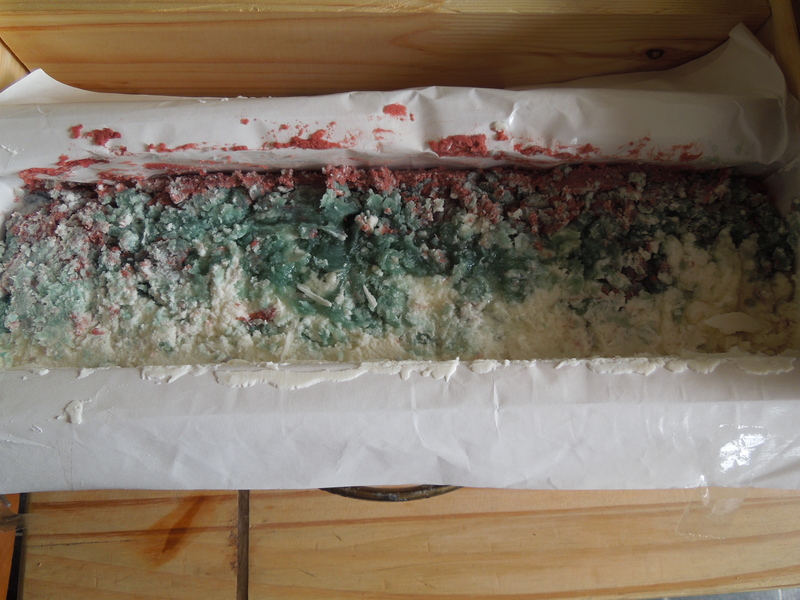 I used it for the first time this week and it was such a pleasure to be relieved of the tedium of mould lining, not so mention the time saved (at least 20 minutes) – hooray! 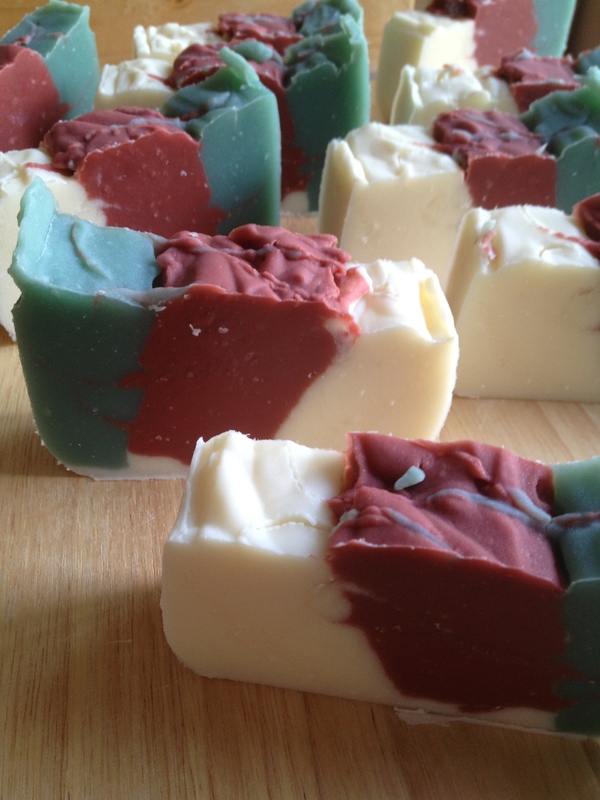 Finding time to make soap (and write about it!) isn’t easy with a 3 year old and a 3 month old in tow, so I’ve resolved to make a minimum of one batch a week – at least until stock is back up to a respectable level. 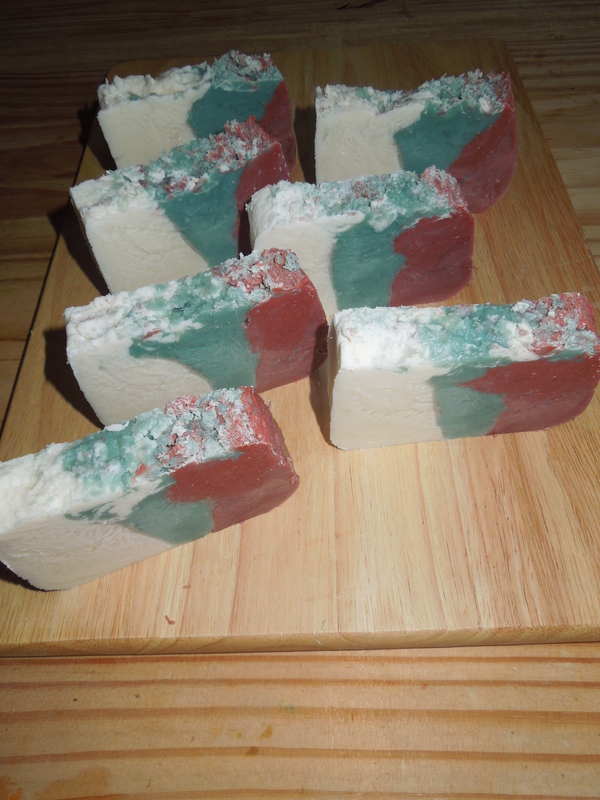 It needs a good five weeks curing time to harden it up, and will be released for sale on 18th August. 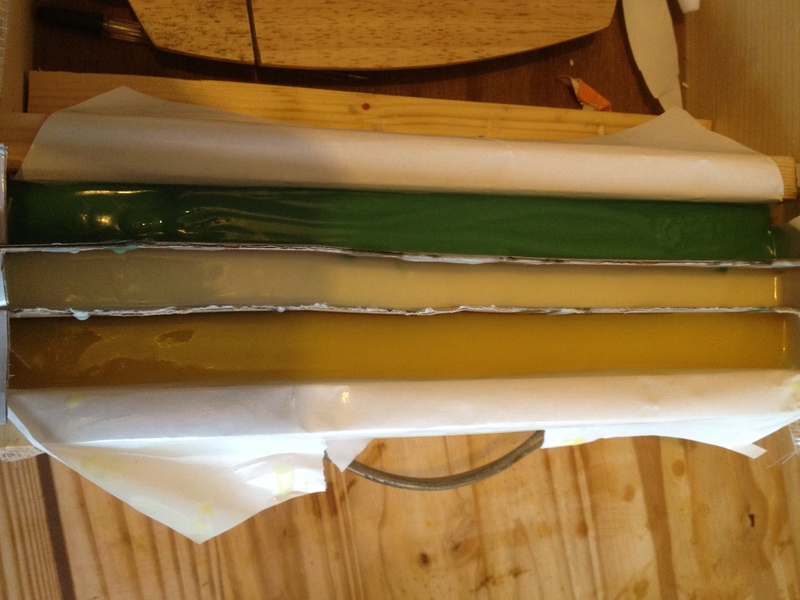 First I divided the mould into three lengthwise using cardboard. 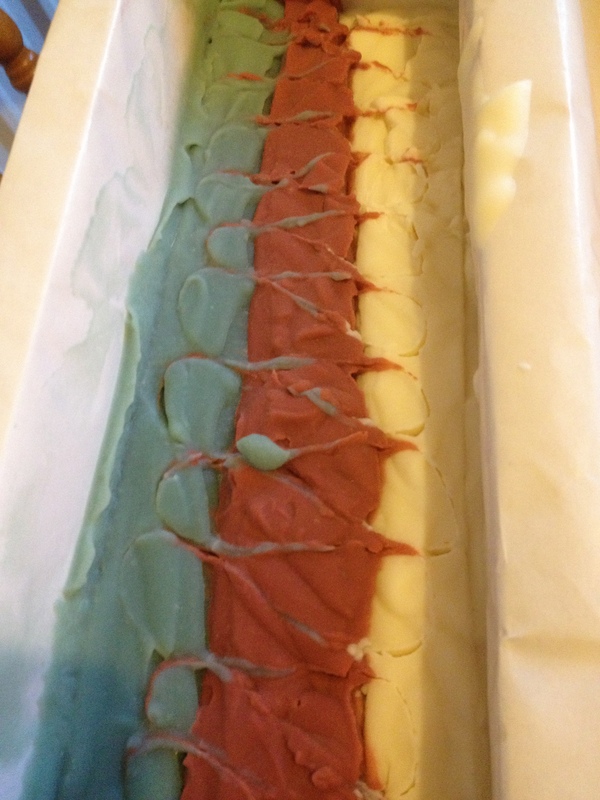 Then I divided my soap batter (made with olive, coconut, avocado, rice bran and castor oils plus shea butter) into three equal portions and coloured one with titanium dioxide, one with hydrated green oxide and one with yellow CP soap colour. 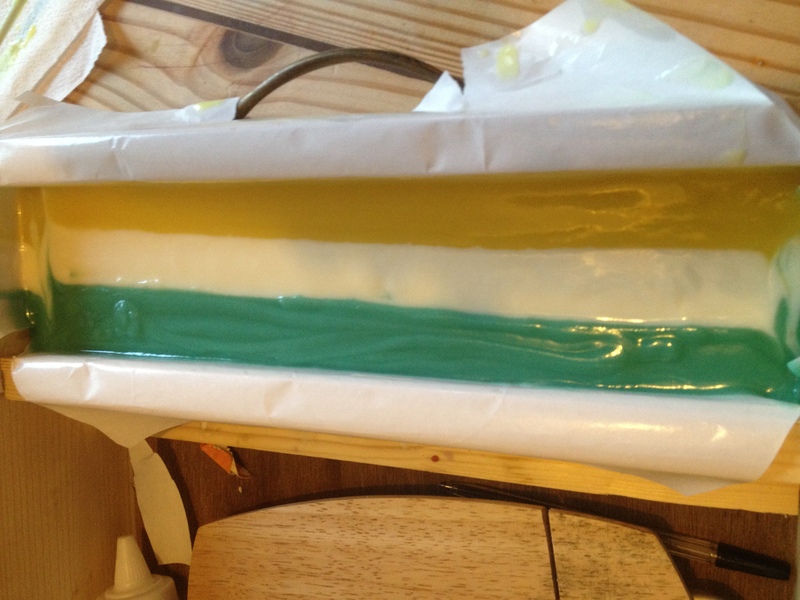 Then one colour was poured into each section – I could have done with a third hand at this stage but just about managed it without too much mess! 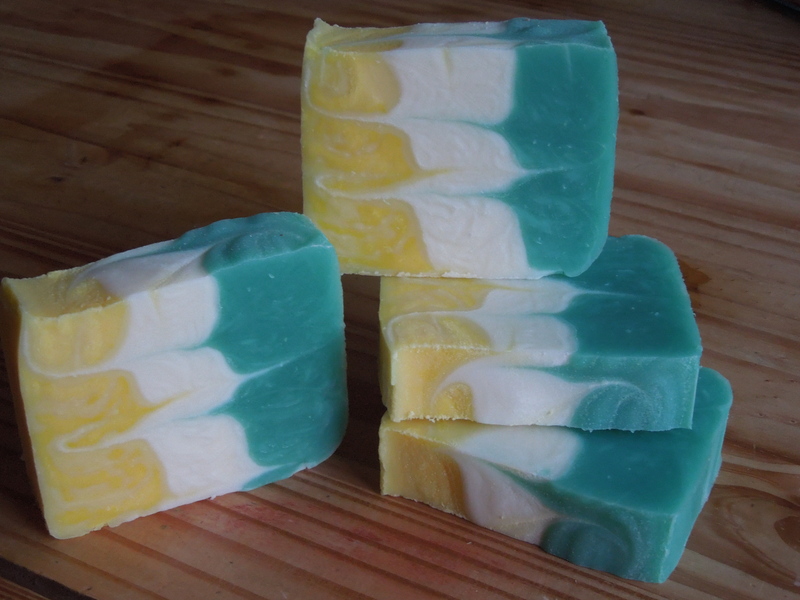 The soap is fragranced with a blend of Lemon and Peppermint essential oils, and smells wonderful – citrussy and fresh – just perfect for a Summer’s day! I’ll end with a quick thank you to Amy for organising this challenge. This was my first time participating, but I’ve loved getting involved and seeing everyone else’s entries, so I’m sure it won’t be the last. 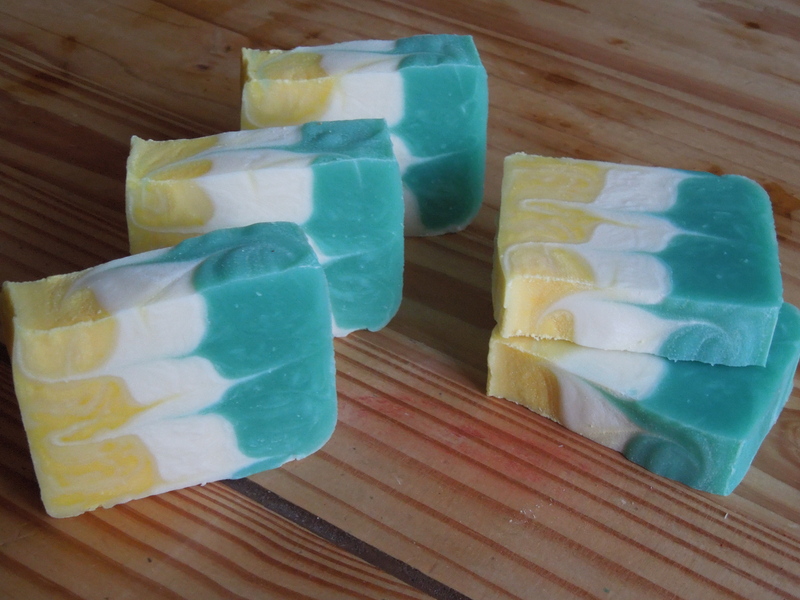 And here it is cut – you can just about see some pattern within the soap, but it’s a very poor imitation of what I was hoping for! But, after some head scratching and giving myself a good talking to I got back on the horse and tried a third time. 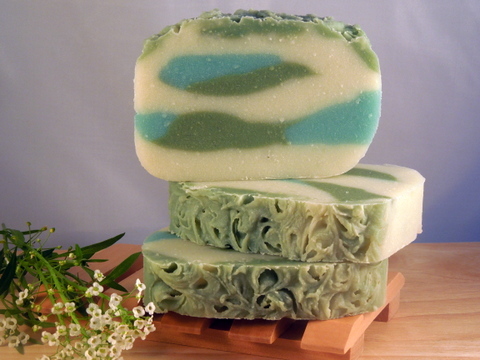 This time I used only natural essential oils to fragrance the mix, as I think the fragrance oils were contributing to the fast setting up of the soap. 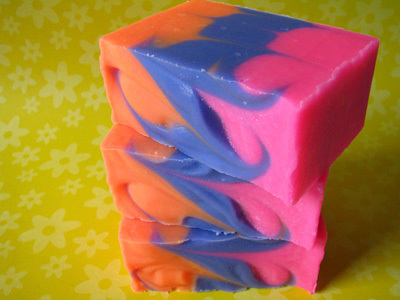 I was also really really careful to keep the soap batter nice and thin to make sure it would pour and swirl nicely. And……..it worked!! 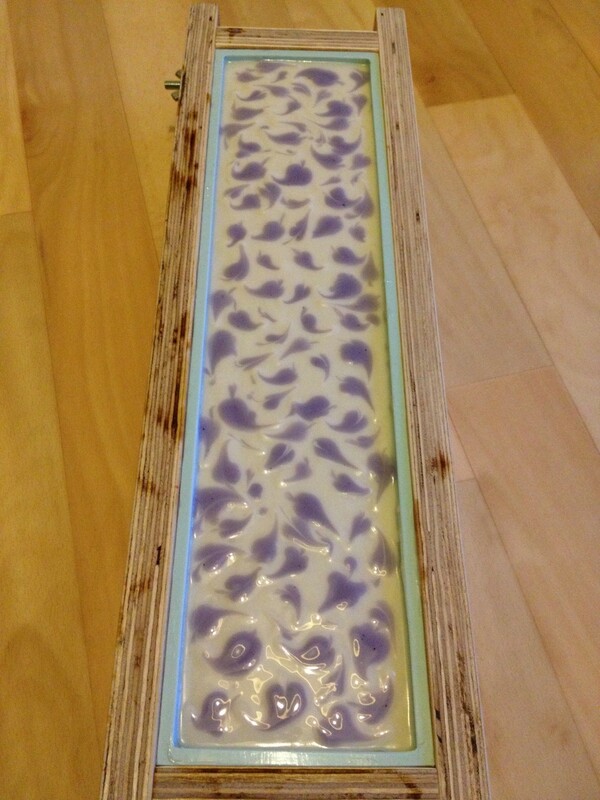 Sunday saw my first soapmaking in months, and my first disaster in a long time…. 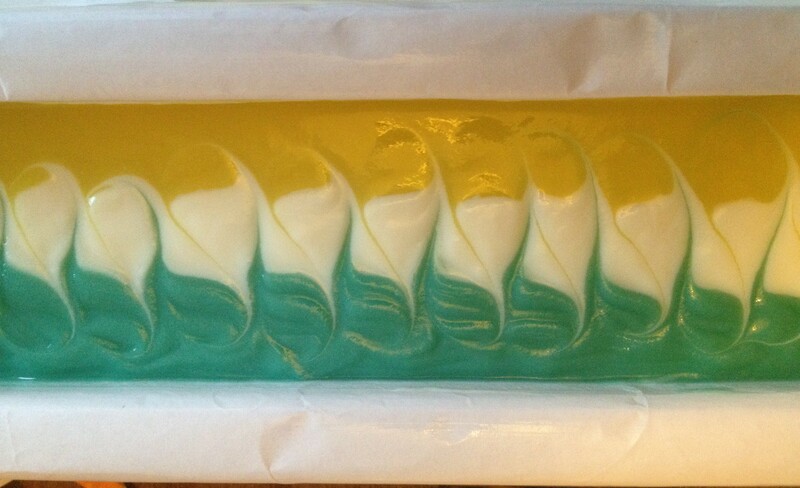 I was all excited to be making my entry into the Mantra Swirl competition mentioned in my first post, but there was much more enthusiasm than skill on display as I played fast and loose with my temperatures 😦 I ended up with a soap that seized on me and basically turned to colourful cottage cheese in the pot before I’d even had a change to pour it, let along swirl it! On a more positive note I took delivery of two new spirit thermometers on Monday and soap making will resume this week – I still have a competition entry to make! !